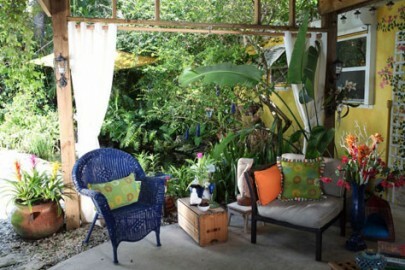 You say that you want to invite some friends over to sit a spell in you garden? And it’s the heat of summer? Before you do, take a look around you garden. Looking kind of sad and worn out? Maybe it is time to freshen up your outdoor space with watering, weeding, and mulching. Our gardens can look pretty beat up as summer gets hotter. Either too little or too much rain. Scorching heat and intense sun wilt and wither many plants. Weeds grow out of control and many of those spring flowers are overgrown and spent. Even our furniture and pots can start to look a little faded and dirty. Here are a few well known tips that are worth repeating. For you experienced gardeners, these tips are just reminders. But, for you newer gardeners, many of these ideas will help you to tidy up your outdoor space. (ARA) – This summer gardens and outdoor green spaces often look limp and lifeless due to lots of hot, sunny days and limited precipitation. No need to despair, just a few simple tips can help to rejuvenate any outdoor space well into fall – and be water-wise as well. So, try a few of these tips and see if you don’t feel a little better about inviting friends over to sit a spell and enjoy the view of your garden. Sorry for the delay, I thought that I had already posted your question. Usually, I feed our plants in the early spring, followed by a light feeding during the rainy season because the excessive amounts of rainfall dilute the plant food. Sometimes, I give the container plants a light feeding in the fall to encourage some root growth for protection in the winter. I really enjoy the sight . All is well, I hope? Mulch is my all-time favorite soil amendment. It’s amazing how it saves water, builds the ground, makes a space look great and provides cover for the earthworms. Good post. Yep…….earthworms under mulch is always a sign that something is right in the garden. Thanks for the comment! These are great tips. I just love this site–great information, great writing! Thanks for the compliments! A pat on the shoulder is always a nice thing.